Travel pillows are preferably designed to provide support to your head and neck in a natural position during the travel. A travel pillow comes in different shapes. U shaped pillow is well suited for flight, bus and train travel where you spend most of the time in a sitting posture. A flat pillow is perfectly suited for lying over the flat surface, to provide adequate back support. 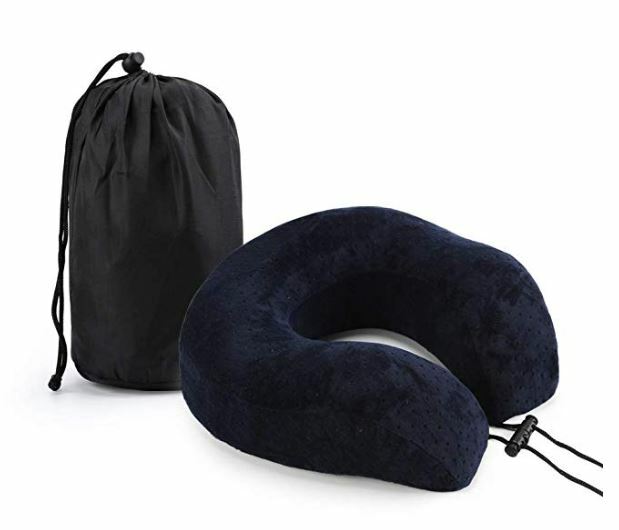 Travel Bliss U shaped memory foam pillow provides excellent support without the awkward positioning and discomfort to your neck during travel. Its U shape allows you to twist your neck in several positions according to your body posture. slipping off your shoulder and allow you to move your head freely in any direction. The pillow has ventilation holes which keeps your neck area cool, allowing you to have a hassle-less sleep. The pillow’ has foam height of 11 cm which is perfect unisex design for full support from shoulder to your chin without getting a stiff neck. This is light weight of 300g and reduces to 1/3 of its size and occupies very less space in your luggage. Even you can use the pillow while working on the laptop, sitting on the couch and watching tv or relaxing over the beach and reading a book. You will get also get a light carry bag with the pillow. This travel pillow comes in four colors (Blue, Grey, Pink, Brown). This U shaped Viaggi Microbeads travel pillow consists of 85% nylon and 15% spandex outer fabric. Spandex adds to the elasticity and durability of the pillow that allows you to stretch it a bit to get adjusted according to your neck posture. It is filled with EPS bead (bean bag consist) in microform which gets adjusted with your body movement. Thus it gives you orthopedic support much like memory foam. The U shaped design allows the pillow to gently cradles your neck while supporting your head for lasting comfort and it doesn’t let your muscles feel any pressure. Weighted just 250g, this pillow is easy to carry for all travel purposes. Also, It comes with a button that helps to keep the pillow intact while sleeping or reading. 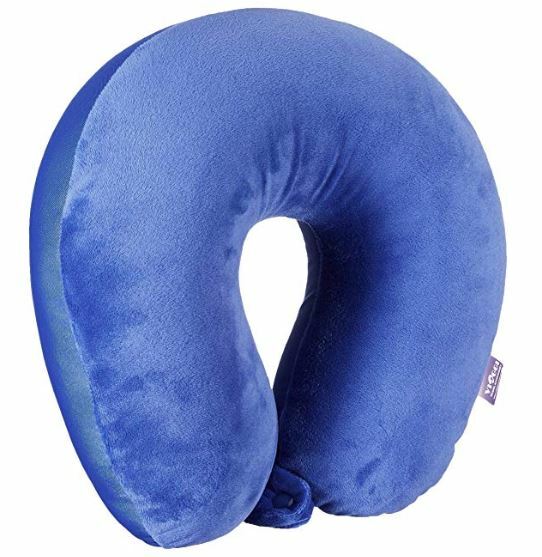 Note:- Viaggi royal blue travel pillow is having smooth fabric, it lacks firmness yet it is comfortable and if your body is not accustomed to the smooth fabric you may find this pillow too soft. It is made up of 80% Polyester and 20% Thermoplastic Polyurethane(TPU). TPU makes this pillow oil and grease resistant along with water. Compared to traditional inflatable pillow VORCOOL inflatable pillow has a curved design with little depth in the middle. The curved verticle lining in the center helps in providing ergonomic support to your head. It also does not capture wrinkles when you fold it and carry in your luggage over the period of time thus making it highly durable. VORCOOL inflatable pillow comes with a trendy storage bag which you can use to carry the pillow. It is also very lightweight (100G) and easy to carry. Require air filling every time. 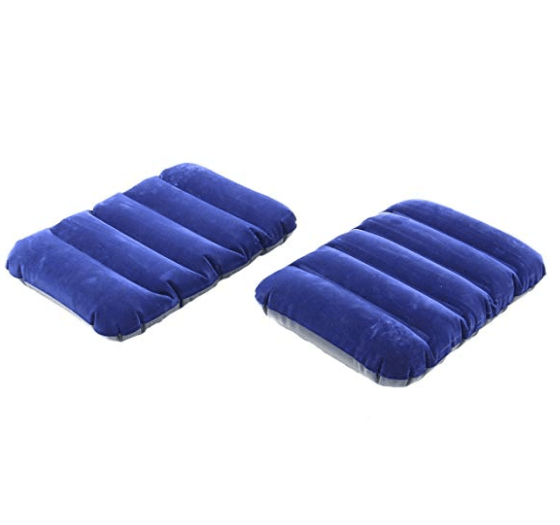 Buyerzone travel air pillow provides you complete support with soft velvet flocked finish. The pillow has an innovative I beam design. This design allows air passage between your body and pillow and thus giving you a comfortable support during your sleep. It also helps in maintaining grip between your body and pillow that lacks in the normal inflatable pillow with the flat surface. Being in flat rectangular shape you can use this pillow comfortably for lower back support while sitting. Note- Upon receiving you will be required to pierce the pillow nozzles first so that air can be blown inside the pillow. 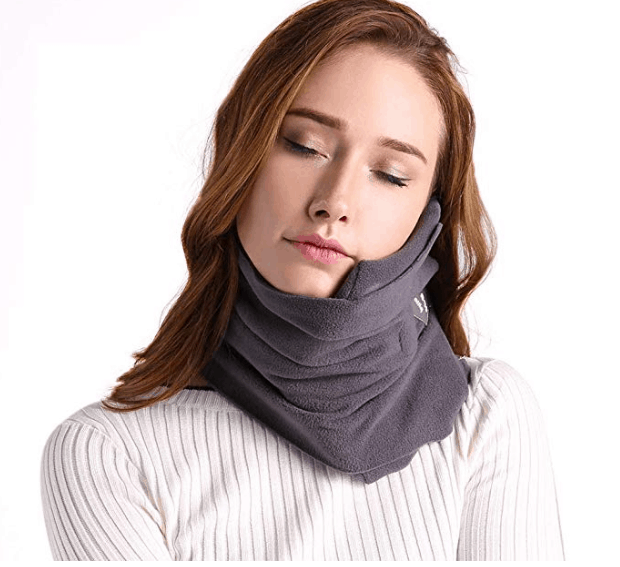 Naptr super soft travel neck pillow is actually a wrap scarf with a hidden inner rib that contours to your neck, and provides support while you sleep. It is primarily made of fabric and not stuffing. It takes up much less space than a traditional U shaped or inflatable travel neck pillow. Whenever you need to put it in the use then you can use the air pump to inflates it. Also unlike traditional inflatable pillow, while blowing up it does not let you feel any pressure on lungs. Naptr Pillow comes with the micro-velvet cover and thus it ensures a comfortable surface for your neck and face while you sleep. It is weighted just 140g. In its deflated state, you can fold it and the entire pillow can fit into the palm of your hand. You can even put it in the water bottle sleeve of most backpacks. If you travel frequently through flight, busses or trains then go for Travel Bliss Unisex U-Shape Memory Foam Pillow. Perfect support and classy look. 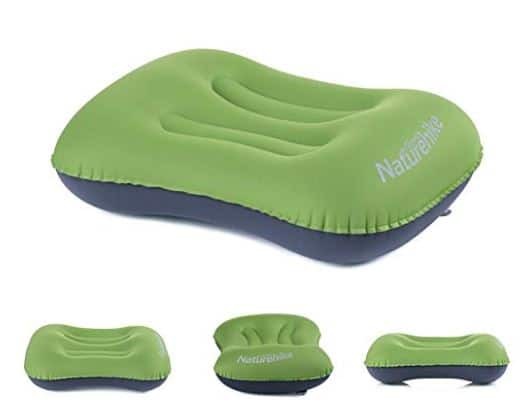 While if you are looking for something for camping and back support then you would be prioritizing lightweight and proper support above all. which makes VORCOOL Ultralight travel pillow the most preferred choice. Its compact and waterproof nature makes suitable for any of the travel adventure.